culate the function between the photon count and the factors. in transmission lines in recently years . harm to transmission security if without fix timely . strands at the early stage in transmission lines patrol. tect the discharge phenomenon by occident at the earliest. vinced performance in actual use. der dry or rainy conditions. (see Fi g u r e 6). Figure 1. 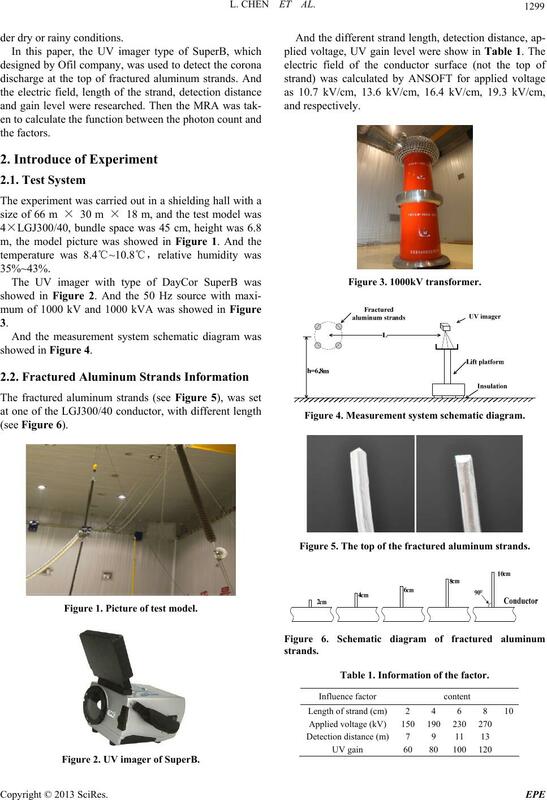 Picture of test model. Figure 2. UV imager of SuperB. Figure 4. Measurement system schematic diagram. Figure 5. The top of the fractured aluminum strands. Table 1. Information of the factor. the corona phenomenon was detected by the UV imager. field 19.3 kV/cm) the photon counting rise at 22660.
of experiment was show in Figure 8.
detection distance is 9 m, UV gain is 100). Figure 8. Influence of electr ic field. 13 m, the results were partly showed in Figure 9.
ductor, the results were partly showed in Figure 11.
dependent variable and several independent variables. to solve practical engineering problem. Figure 9. Influence of detection distance. Figure 10. 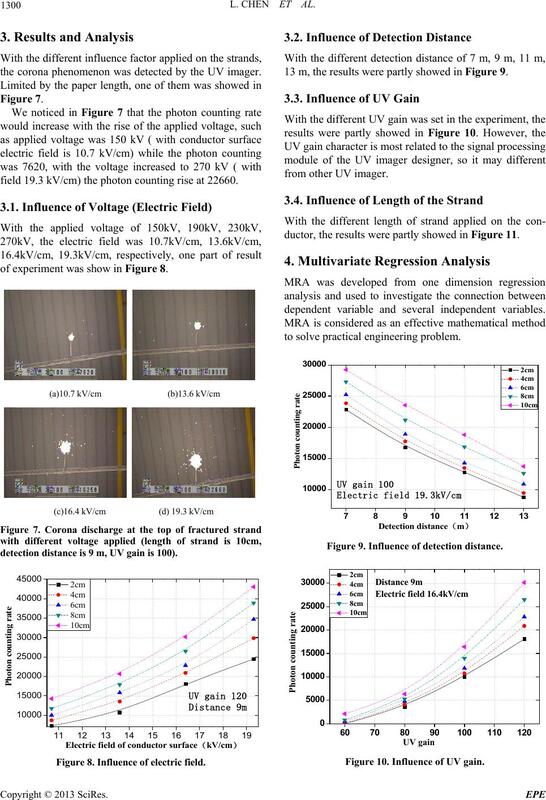 Influence of UV gain. length of strand was set as s, cm. T test , showed in Equation (2) ,(3) and (4). Figure 11. Influence of stran d length. Table 2 . 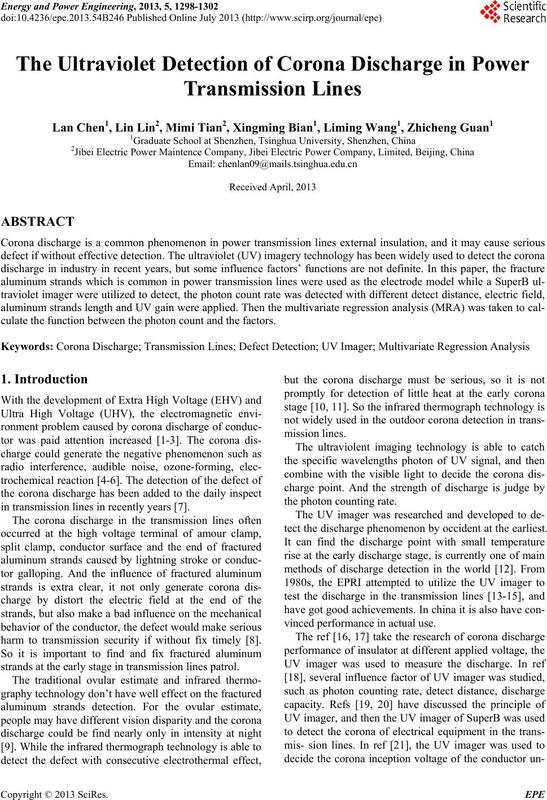 Mra about photon coun ting rate and signif icance test. in practical transmission lines patrol of corona discharge. China Economy Press, 2005, pp. 136-139. Vol. 27, No. 31, 2007, pp. 1-6. Hydroelectric Engineering, Vol. 27, No. 6, 2011, pp. Phenomena, Atlanta, America, Vol. 2, 1998, pp. 508-511. N. Taku, O. Takao, M. Hiroji, M. Hideki, S. Shozo and A. Transactions on Power Delivery, Vol. 18, No. 1, 2003, pp. search, Vol. 1, No. 6, 2005, pp. 12-18. 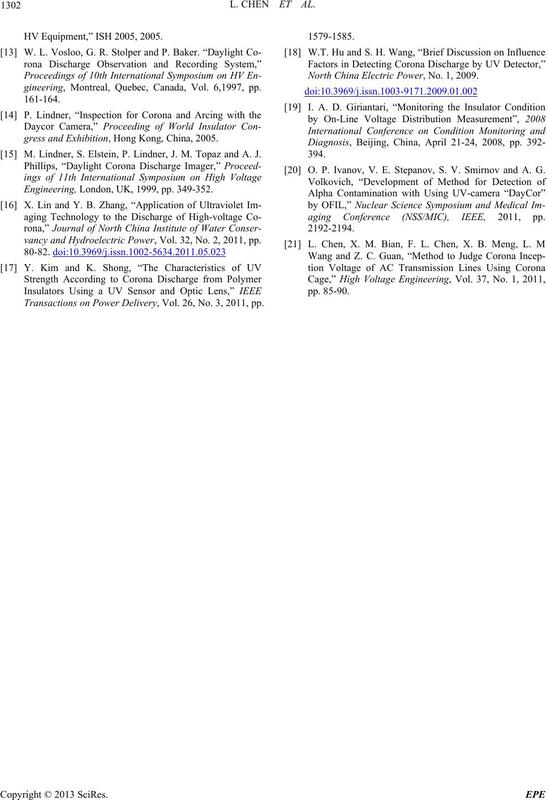 Y. C. Cheng, C. R. Li, X. J. Shen, M. Chen and R. H.
ing, Vol. 30, No. 6, 2004, pp. 35-37. 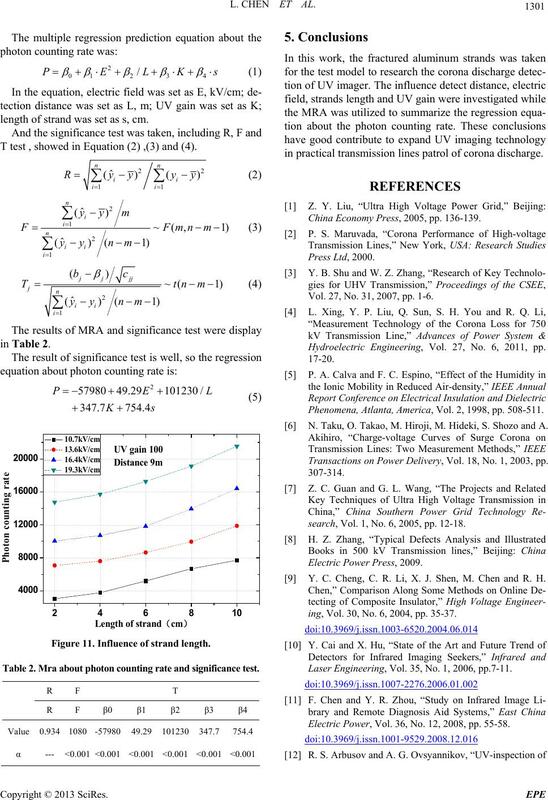 Laser Engineering, Vol. 35, No. 1, 2006, pp.7-11. Electric Power, Vol. 36, No. 12, 2008, pp. 55-58. HV Equipment,” ISH 2005, 2005.
gineering, Montreal, Quebec, Canada, Vol. 6,1997, pp. gress and Exhibition, Hong Kong, China, 2005. M. Lindner, S. Elstein, P. Lindner, J. M. Topaz and A. J. Engineering, London, UK, 1999, pp. 349-352.
vancy and Hydroelectric Power, Vol. 32, No. 2, 2011, pp. Transactions on Power Delivery, Vol. 26, No. 3, 2011, pp. North China Electric Power, No. 1, 2009. O. P. Ivanov, V. E. Stepanov, S. V. Smirnov and A. G.
aging Conference (NSS/MIC), IEEE, 2011, pp.